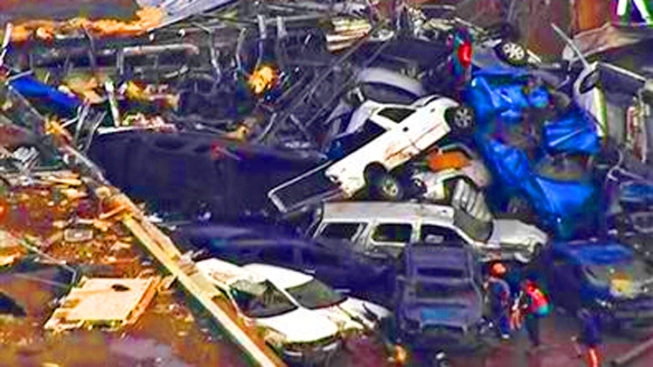 Destruction near Oklahoma City after a tornado touched down on Monday. Deadly tornadoes that have raked communities in Middle America over the past week, including Monday's massive twister that carved a path of destruction through the Oklahoma City suburb of Moore, belie what had been a relatively quiet start of the 2013 tornado season. In fact, this is the longest the United States has gone into May without registering an EF-1 or stronger tornado, which are the types that can cause damage, according to Harold Brooks, a research meteorologist at the National Severe Storms Laboratory. The deadly tornado strikes began Wednesday, when a twister outbreak in North Texas killed six people and injured dozens of others, many in Granbury. A massive storm system that moved through the Plains and Midwest on Sunday produced tornadoes in Kansas and Iowa, but it was Oklahoma that bore the brunt of the destruction, with at least 39 injured throughout the state and two deaths from a tornado strike near Shawnee, 30 miles east of Moore.